Corrine Brown, the former Jacksonville-area Congresswoman sentenced in 2017 to five years in federal prison for fraud, will begin her sentence on Jan. 29. Brown is appealing her sentence. Brown will report to Federal Correctional Institution Coleman, located in central Sumter County, Fla.
Action News Jax will have live coverage from reporter Jenna Bourne of the proceedings starting at 4:30 a.m. Monday on FOX 30, with additional updates on CBS47 at Noon and CBS47 at 5. You can also get updates through the day on our radio news partner News 104.5 WOKV. 1. Coleman Medium houses male and female offenders. Nearly 2,000 federal inmates call FCI Coleman Medium home. Around 400 of these inmates are housed at the prison's camp, which is where Brown is expected to be housed. Aerial photos from Google show a massive complex complete with softball fields and basketball courts. The complex is about 140 miles from Jacksonville. A federal judge allowed Brown to request an area where she would be incarcerated -- and she chose Florida. There are three federal facilities in Florida that house female inmates. Inmates reportedly start their day at 6 a.m. Their day ends with a 9 p.m. head count. 2. The complex houses some of the most notorious federal inmates in the country. One of Coleman's newer inmates is infamous Boston gangster Whitey Bulger, who was transferred there in 2014. Bulger was on the FBI's Ten Most Wanted List for nearly 20 years before he was finally captured in 2011. Bulger, now 88, has written and lectured from prison and famously said the only way to make crime pay as "to go to law school." Other famous inmates include: Allen Stanford, who ran a $7 billion Ponzi scheme, and Somali pirate Gabul Abdullah Ali. Leonard Peltier, a leader of the American Indian Movement, is housed there. He was convicted of killing two FBI agents during a 1975 shootout. 3. Want to see Corrine's mugshot? That won't happen. Federal prisoner mugshots are rarely released. The federal government does allow you to search for inmates and provides information about them. Click here to search for one. 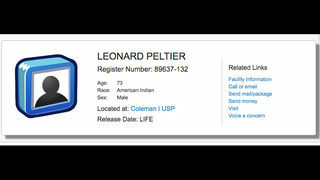 For example, a quick search for Peltier shows he is 73 and is housed in Coleman's maximum security wing. 4. Corrine will still be able to collect her federal pension while in prison despite her conviction. Brown can draw an annual annuity of up to $66,000 due to a loophole in the Honest Leadership and Open Government Act of 2007, Fox News reported. She can get the money until all of her appeals are exhausted, which could take a long time. 5. A rare media tour in 2010 offered a glimpse into daily life at the prison. A full 15 years after its opening, officials gave reporters access to the daily routine of the inmates. It was noted on Ocala.com that the only female inmates are housed in the satellite work camp that is expected to house Brown. In 2010, the Ocala Star-Banner published a profile of the prison that said, "At Coleman, each inmate is given a job assignment, in which they can earn money to use at the prison commissary, for instance, to purchase things like snacks, aspirin, or personal hygiene items, though these items are marked up 30 percent. Depending on the pay grade, such jobs will net anywhere between 12 cents to 40 cents an hour." For female inmates, visiting hours are Saturday, Sunday and Monday.